This afternoon finds me sitting and going through the Inn’s recipe book and I find some old favorites, some we have been making for years. You think when you are an innkeeper that you will never make an error in your kitchen, never forget an ingredient, etc. but that is so not what happens. I think we all have those recipes that we use time and again not just because they taste good but also because they are very forgiving and allow us to make mistakes and still produce a great breakfast. 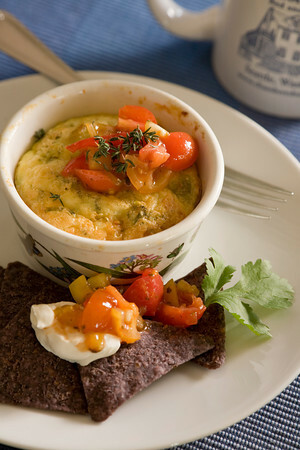 This Southwestern Quiche recipe is one of those. We have been making it for the last 15 years, I think it might have been the first breakfast we ever made, however, I will always remember the countless times I have forgotten the butter (it is still fine, although makes a little less and is a little dry) or the time we made it with regular jack cheese and not the peppered jack because I bought the wrong kind and did not realize it till it was too late, or my favorite, the time we made it with diced jalepeno peppers and not diced green chiles, those little cans all look just alike! OK, that morning, the people from Texas loved it, the Alaskans, not so much (we made them a different entree), but through it all this is one great dish, we make it all the time and guests always rave about it. and after 15 years, I still eat it too! By the way, this is a crust less quiche and will fill 6 (6oz) Ramekins nicely. Preheat oven to 375 degrees. In a large bowl, beat eggs. Add Flour, beat again, the mixture will be a little lumpy and that is OK. Mix in cottage cheese, jack cheese, butter, chiles, and cilantro. Pour into 6 well greased (we use a vegetable oils spray) ramekins. Serve with sour cream, salsa, and blue corn tortilla chips.